Don't wear flip flops or new shoes. Breathtaking but a tough hike! 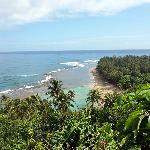 We hiked the first 2 miles of this trail to the Hanakapiai Stream & Beach. 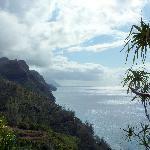 Medium difficulty hike but fabulous views of the Na Pali coastline around every corner. We crossed the stream and had lunch on the rocks at the beach before hiking back. It took about 3.5 hours total and was well worth it. Bring a camera, water, and food or snacks. 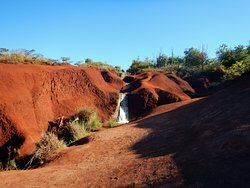 If you can't do the 2 miles at least go 1/2 mile in to the Ke'e Beach overlook. 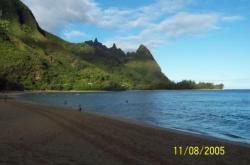 Then go about 100 yards further and you will have a great view of the Na Pali. 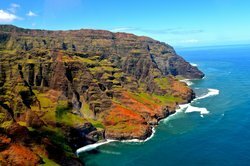 Incredible views of the Na' Pali coast. We only went in 1.5 miles but it was far enough to get some great photos. Next time, I'd like to go 2 miles and then head inland to the waterfall another 2 miles. I have hiked this trail many times, and I love every inch of it. It does get narrow in parts, and if you're afraid of heights, this section can be scary. I have never felt unsafe hiking this trail. It's a long hike and usually people don't hike it both ways, so pack it light and bring lots of water. There are water stations, but I wouldn't trust it. Most people hike the eleven miles one way and then camp out. I also recommend finding a house to rent on the island. 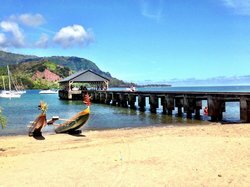 There are a ton of great deals for renting and it is much more fun than a hotel. 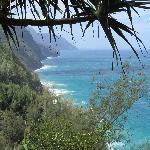 Take a look at Kauai Vacation Rentals on their FB page. Oh my Lord this was fun/exhausting! Not for the lighthearted. Need to wear your hiking/water shoes for you cross rivers/streams & walk on boulders/rocks. It gets hot esp going up the switchback areas. SO beautiful! IF you're a hiker, you can't miss this. It was the highlight of our trip. We did the 1st 2 miles, then 2 miles up to the falls & back, so a total of 8 miles & I'm 53. I couldn't walk for 2 days after....it was still a great experience & I'm proud that I still have what it takes! 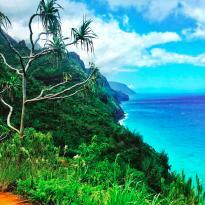 We did the 8 mile walk to the waterfalls and it was an incredible hike with stunning views of the Napali coast. It is not an easy hike and the trail was quite muddy but it was so worth it. 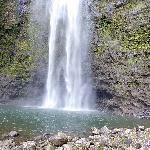 The waterfalls are very beautiful and an excellent place to have lunch and a swim. I would not recommend to do this with little childeren as it will take you easily 6 to 8 hours to complete. Otherwise go for it, just incredible.